…and have 207 beautiful, brave, clearly remarkably intelligent and compassionate supporters. I want to thank you with all my heart! I also write this because it is the 21st August and Deaf and Disability organisations from across the United Kingdom will today highlight the Government’s ongoing human rights violations and evasive behaviour towards a major United Nations committee. This is happening today because the UK government has to date ignored all questions, recommendations and reports about the grave and systematic abuse of the rights of disabled people put forward by the United Nations and other bodies. Their apparent refusal to acknowledge our human rights is frightening – more so when we see swastikas being waved openly in America and fascism rising across Europe. 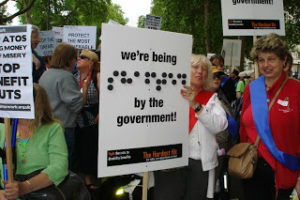 As disabled people, we cannot help but feel under attack. We are reminded of the Nazi’s destruction of their own deaf and disabled community, T4 Aktion Plans. I wrote CULL as a way to counter the fear and importantly, to make some noise! I do NOT believe that people would condone the mistreatment of deaf and disabled people if they first knew about it and secondly understood how it felt. I sucked up that poison and poured it into CULL – although in the completed manuscript I NEVER mention T4 directly and it isn’t important whether you have heard of it or not. I litter CULL with small details: the grey vans, the residential homes, the nurses and, in particular, the attitude of the doctors. The effect of this is historical resonance, which, when reading, gives an uneasy greasy feeling in your stomach, acting like some essential but sour ingredient in an otherwise delicious recipe. It gives CULL its dark interior and an added intensity. I feel, through writing CULL – AND getting it published thanks to YOU – I will be changing Nazi poison into literary medicine. My doctor is known as The Good Dr Binding. The Good Doctor’s hands are dry and warm, healer’s hands. He can take a temperature through them, feel a pulse, reassure a person just by placing those long fingers on a cheek or forehead. The nursing staff, technicians and even the cleaning staff love him. He has the energetic geniality and thoughtfulness of a man who knows how important everyone, every cog in the wheel, is to the good running of the system. He cares about them all. And the patients love him too. He doesn’t sugar coat anything. His bedside manner is assured, competent and efficient but he really looks, really sees, really feels for each and every person he treats. ‘Oh, doctor!’ Polite laughter all round. With Grassybanks, The Good Doctor is only required to visit twice a week, although as Ward B and soon-to-be Ward C are his own personal projects, he is in most days. He always meets first with the nursing staff, clinical officers and any additional staff to discuss the patients and how they have spent the night or day. He answers questions and cracks a few jokes, and then he and his entourage will head off to the Wards. In Ward A he meets patients, reassures them, reviews medication, listens to the clinicians and nurses and makes decisions on future rehabilitation. In Ward B there is less chat. When Ward C eventually opens the doctor expects there to be none. Oh, Tanvir – maybe it’s because I am so tired – physically and emotionally – at the moment, but this piece reduced me to rubble. I am always impressed by people who can ‘do’ something with the dreadful aspects of the human condition, something positive … you are one of those people. Thank you Tamsen and right back at you! Big hug and a foot-up out the rubble- if you pull me out behind you!